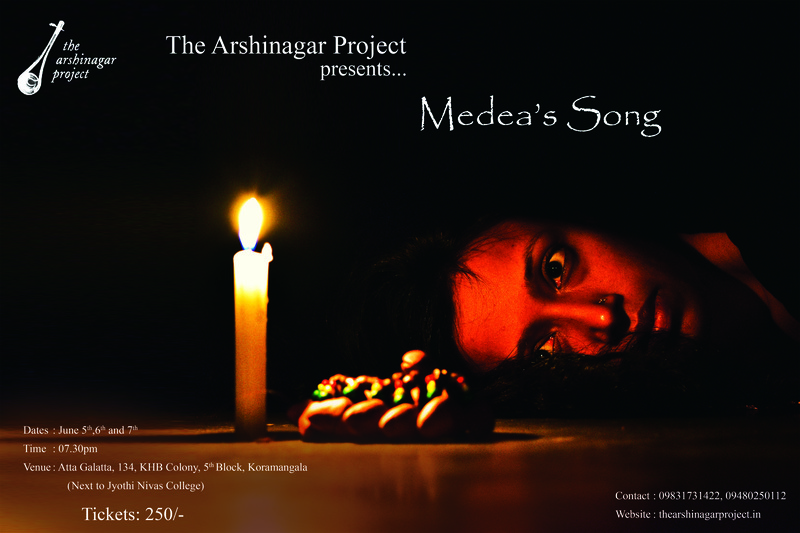 The Arshinagar Project presents “Medea’s Song”, a devised physical theatre performance based on Euripides’ Medea. Through an intensive laboratory process investigating the interplay of energy, breath, rhythm, movement, song and text, the ensemble has explored the wild and raw passions, the sensuality and cruelty, the primary colours, the horror and the tragedy of Medea, one of the strangest and most magnificent tales ever told. First performed nearly 2,500 years ago, Medea has continued to baffle and shock audiences through the ages, for the well-ordered moral universe of Greek theatre, with its strict sense of cause and effect, crime and punishment, seems to collapse here, leaving a hole in the centre – Medea’s cold blooded murder of her own children goes without any consequence. A vast canvas where human passions play out on an epic scale, the play is nevertheless very close to our fractured, broken world. It is as much about gender as it is about the ‘clash of civilizations’. Medea, a woman and a ‘barbarian’ in the so-called ‘civilized’ world of the Greeks, where the men make all the decisions, finds herself used and abandoned by her husband, Jason. Oppressed, friendless and hurt, she takes a terrible revenge by killing her own children. Perhaps more than anything else, Medea is about love – a love that loses its proportions and turns to hatred. This production eschews conventional storytelling, and in stead delves into the central themes of power, oppression and vengeance, of what it means to ‘belong’, and what it means to be an ‘outsider’, the ‘other’, of lust, eros and death. It is in the form of a suite of interweaved ‘spatial poems’, that use movement, rhythm, singing as well as text, to ask, ‘what makes us destroy what we is dearest to us in the world? Devised and performed by: Anjali Nair, Anna Olkinuora, Deepali Verma, Meera Murthy Dhage, Sivan Venkitangu.